Chrysanthemum white rust (Puccinia horiana) is a serious fungal disease of chrysanthemum. This disease was first discovered in Japan in 1895 and was confined to China and Japan until the 1960s. Today it is established in Europe, Africa, Australia, Central America, South America, and the Far East. White rust can spread quickly in greenhouse and nursery environments causing severe crop losses. Eradication of this pathogen is feasible because P. horiana has a limited host range, requires green host tissue, and spreads inefficiently. Chrysanthemum white rust (CWR) is a quarantine significant pest in the United States; therefore, occurrence of this disease leads to state and federal regulatory action. In the last 25 years localized introductions of chrysanthemum white rust have occurred within the United States or Canada and have subsequently been eradicated or are being eradicated. In recent years, CWR has been detected in Massachusetts. pot mums, spray mums, and garden mums ( Dendranthema X grandiflorum = Chrysanthemum morifolium ). 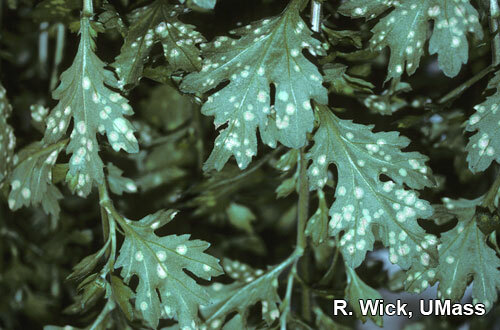 The symptoms of chrysanthemum white rust are very distinct; light green to yellow spots up to 5mm in diameter appear on the upper surface of the leaf. These spots become brown and necrotic with age. Raised beige to pink pustules form on the underside of leaves beneath the spots. Pustules become white with age. Pustules are most common on young leaves and flower bracts but may form on any green tissue or the petals. Symptoms usually occur during cool, wet weather. The disease is brought into the greenhouse on infected plant materials. Infected plants may look normal until the correct environmental conditions encourage symptom development. Hot and dry weather may delay onset of symptoms for up to eight weeks. Fungicide applications may also suppress disease development. CWR can also be spread to uninfected plants on contaminated soil, litter, dead leaves, gardening equipment, clothes, shoes, and hands. The pathogen requires living host tissue to grow and reproudce. CWR produces two types of spores. Teliospores are in the pustules on the underside of leaves and remain on the pustule unless they are aggressively brushed off. Teliospores can persist up to 8 weeks on pustules attached to leaves. Teliospores produce basidiospores under cool, moist conditions (96-100% relative humidity for at least three hours). Basidiospores are fragile and short-lived (1 hour or less depending on the humidity) but they are responsible for explosive epidemics under the correct environmental conditions. Infection can occur when temperatures are cool (between 40-73F with an optimal temperature of 63F) and relative humidity is high (96-100%). A film of free water on the leaves is required for infection. Symptom development usually occurs in 5 to 14 days. The first step is to prevent CWR from being introduced into your facilities. Obtain materials from a reputable supplier. Inspect them when they come in and regularly thereafter for symptoms of white rust. Use good cultural techniques to limit spread of disease. Look for development of disease symptoms especially during cool, moist periods. Water plants using drip tapes or individual emitters if possible to avoid water splash and spreading the disease via overhead irrigation. Do not keep any plantings of chrysanthemums on your property from year to year. When using rust fungicides preventively, rotate among active ingredients and FRAC codes. Use contact (e.g. chlorothalonil and mancozeb) as well as systemic (strobilurin and DMI) materials within the rotation. Follow all label precautions regarding whether treatments are recommended for plants in flower. CWR is regulated in MA by the Massachusetts Department of Agricultural Resources (MDAR) and federally by USDA Animal and Plant Health Inspection Service (APHIS). Contact, FRAC code 5: chlorothalonil (Daconil, Echo), chlorothalonil plus thiophanate-methyl (Spectro), mancozeb (Dithane, Protect T&O), thiophanate-methyl (Cleary's 3336), flutolanil (Contrast), pyraclostrobin (Insignia), and myclobutanil (Eagle). *FRAC code = Fungicide Resistance Action Committee Group number. See www.frac.info. 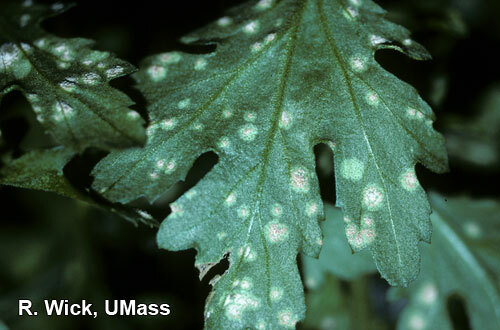 USDA, APHIS, Chrysanthemum White Rust home page contains the national management plan for CWR exclusion and eradication.